Home Companies Guangzhou YongYiTong Trading Co.,Ltd. The Assassin's Time is defined as a male fashion wrist watch, whose design inspiration comes from life, pays attention to the expression of personality and the exploration of inner appeal, and accords with the aesthetic taste and preference of modern men. What conveys is a kind of spirit and belief. 1.The real color of the item may be slightly different from the pictures shown on websitecaused by many factors such as brightness of your monitor and light brightness. 1. A top fashion accessory, Alloy case and stainless steel back cover, strong and sturdy in structure. 2. Strict to control the quality, every pc watch need test over 5 times before shipment. 3. High Quality Material and Competive Factory Price with prompt delivery. 4. Imported Japan quartz movement, keep precise time,Nice Battery Use. 5. 3ATM water resistant, hand wash, rain day, sweating, no problem! Perfect for all kind of business, casual, indoor activities and daily use. 6. NOTE: Please DO NOT pull out the button under the water. 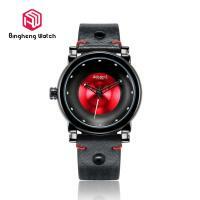 Too much water contact or usage in extreme Hot or Cold temperature will damage leather band and shorter watch life. Q: What's your production capacity per month? A: Our production capacity per month is 600,000pcs. Q: What is your minimum quantity? A: Normally, our minimum order quantity will be 300 units. 2. Please DO NOT PULL OUT the Button Underwater. 3. Watch in extreme Hot or Cold temperature will shorter watch life.